A friendly reminder that the City & County of Honolulu's Department of Environmental Services (ENV) will be implementing changes to the plastic bag ban (Bill 59) taking effect Sunday, July 1, 2018. Among the changes is the requirement for businesses to charge a minimum of 15 cents per compostable, recyclable paper or reusable bag they provide to customers to transport merchandise. 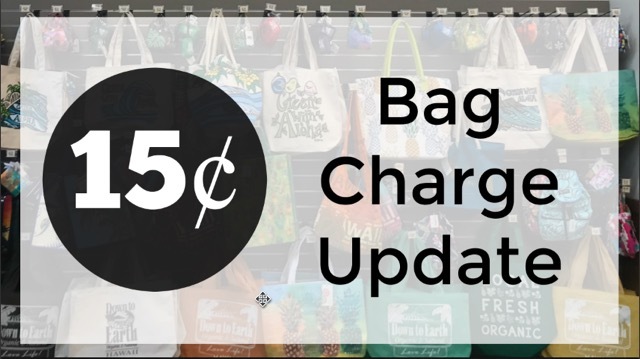 This bag charge doesn't apply to bags used by customers inside a business to package loose items, such as fruits, vegetables, nuts, ground coffee, grains, candies, or small hardware items. It also doesn't apply to bags used to protect or transport prepared foods, beverages, or bakery goods. We encourage residents to bring their own reusable bags when shopping to help the environment and save you money! Many stores give a discount for each reusable bag you use, like Kōkua Market, Down to Earth, and Foodland locations. For more information about this Bill, please visit the Honolulu City & County website.